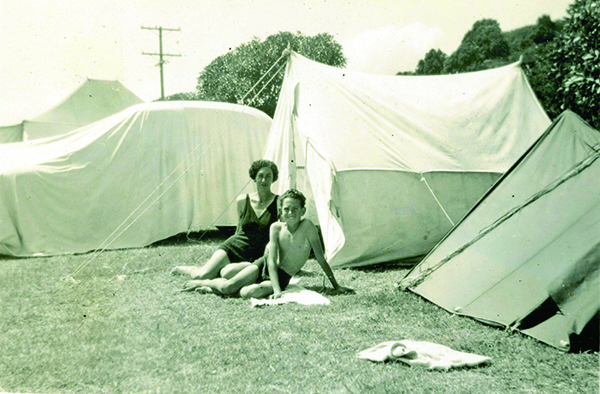 Before I was born, my parents bought a two-man ex-US army tent. They used to go away for weekends and sleep in the tent. Several years later, when I was a young child, this tent was handed over to me and my parents bought a larger tent for themselves. I was very excited to have the tent, and I pestered them to let me camp in my ‘new’ tent on our lawn for one night. I was an only child and I lived in Wellington, NZ. When it rained (read: sleet) later that night, cold water flooded the bedding and me, and Dad came and took me inside. That was the end of my first big camping adventure. 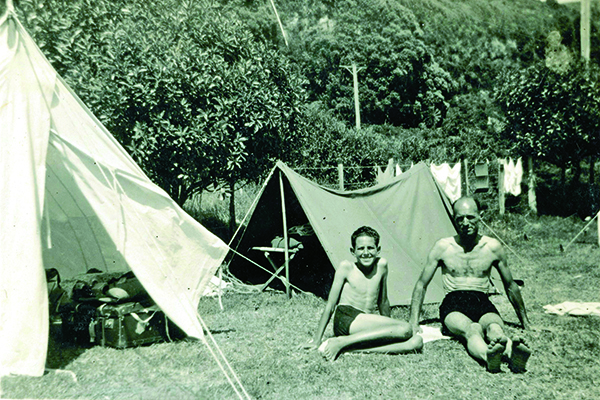 When I was about 10, my best mate Ian and his parents invited me to go camping with them at a local beach called Paraparaumu. We slept in a tent beside his parents’ caravan. Ian and I found a canoe on the beach and, late one night when his parents were asleep, we retrieved the canoe and went for a paddle. Unfortunately, a storm broke, and Ian’s parents came to check on us and found us missing. The canoe rolled over in the rough conditions, and we returned to camp soaking wet and freezing to receive a well-deserved tongue lashing. We went home the next day, where I had to face another bad episode explaining it to my parents: it was an unfortunate end to my second camping experience. 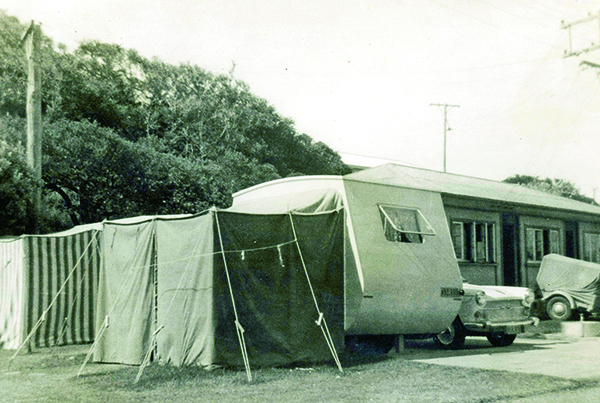 My parents and I went camping often, until finally Dad bought a caravan. It was made of plywood with louvre windows. I was given their bigger tent and more freedom, as there was no room for me to sleep in the van as well. There were no weight distribution hitches then, and I can remember the car bottoming out several times. 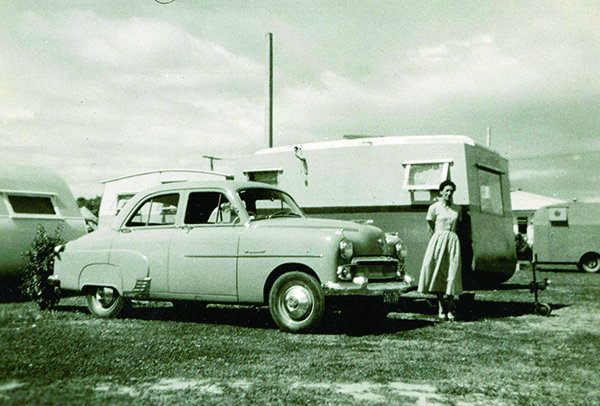 Later, another plywood caravan was bought, followed by a third van. 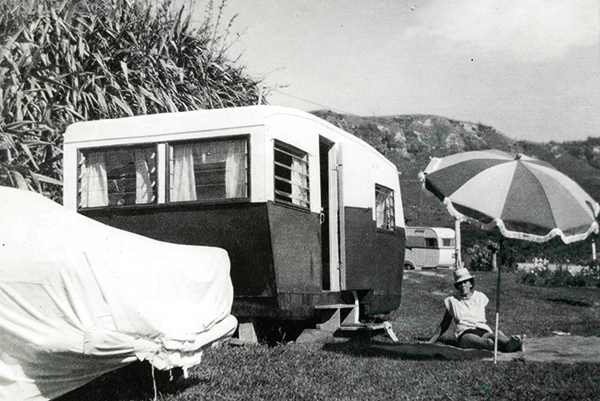 We continued our holidays locally in the Wellington area and around the North Island, until I was about 17 and bought my first car. My dad towed these vans with a new Vauxhall Velox and an Austin A60. I guess he was lucky not to pull the back out of the cars! When I was 19, I came to Australia on a working holiday and met up with three other kiwis who were selling the windscreen cleaners with squeegees that you now see in every service station, as well as the self-wringing mops with sponge heads. This was the first time they had been seen in Queensland, and we sold them to resellers in towns along the way. I travelled with Don, Paul and Ken from Brisbane to Cooktown. In those days (1960-61), a lot of the roads were basically dirt tracks. 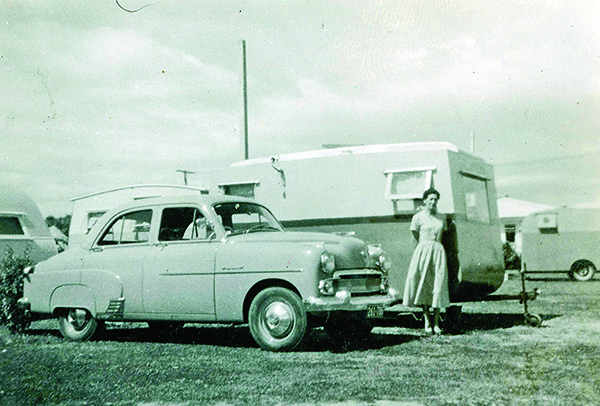 Don pulled a caravan with his almost new Holden, and had his girlfriend with him. In Rockhampton, Paul struck up a friendship with a girl who had two-year-old twins and whose husband was a strongman with a travelling circus! He had left her in a caravan in the van park there. 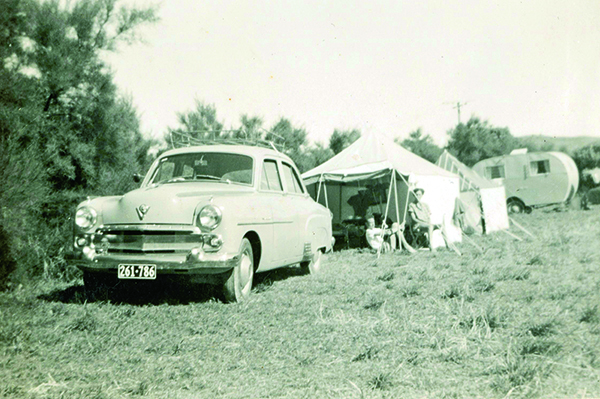 Paul put a towbar on his old 1937 Buick, hitched up her caravan and we continued on north. Ken and I didn’t have vehicles, and slept in on-site vans in van parks or in cheap hotels. We had no trouble, that I remember, with the vans or vehicles, and Ken and I had a ball doing what young guys did then: chasing girls and drinking beer in the towns we visited. Eventually, I returned to NZ for a couple of years, and did a correspondence course in journalism. I returned to Queensland permanently in 1965, and met Denyse in Cairns in 1973. 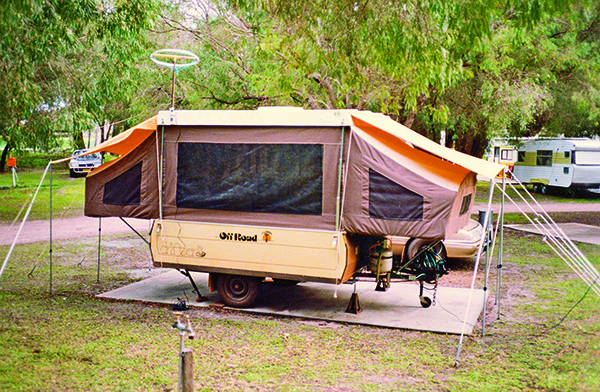 Our first RV trip together was a working holiday around Australia in 1974-75 in our new two-door Ford XB Falcon Hardtop GS. Suffice it to say, we had many great and bad experiences. We did thousands of miles of dirt and corrugated roads back then and, being young and bulletproof, thought it just part of the adventure. Another great interest of ours is boating and we decided to settle in Bowen, Qld, because of the great boating opportunities. We worked together there in our medical practice for seven years, using our power boats at every opportunity. We then purchased a charter yacht, obtained our Grade 5 Masters tickets and spent the next seven years skippering Arabesque on 7-10 day trips for two people through the Whitsunday Islands. At this time, I started writing freelance for boating magazines, and we received most of our charter enquiries from my articles. We sailed up the coast from Bowen to Cape York and the Torres Strait twice, so have seen Cape York from a different perspective from those who drive up there. 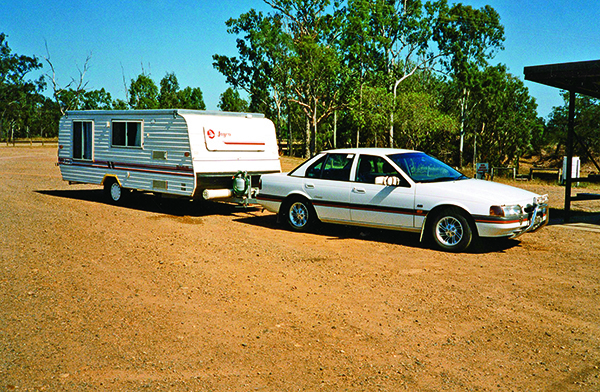 In 1988, we sold everything in Bowen and set off for another around-Oz trip, with a new, small offroad Cub camper trailer pulled by our 1986 Commodore. An offroad camper in those days had 13in wheels instead of 12in! 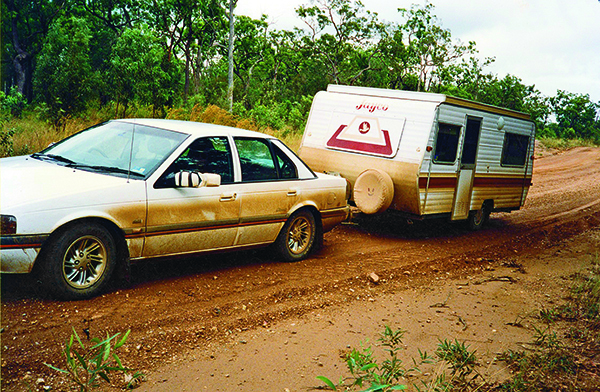 We took the camper and car on many bad roads, even 4WD tracks: that car and van went everywhere we were game to take it. Bear in mind that there were no mobile phones in 1988, so no way to call for assistance if we got stuck. 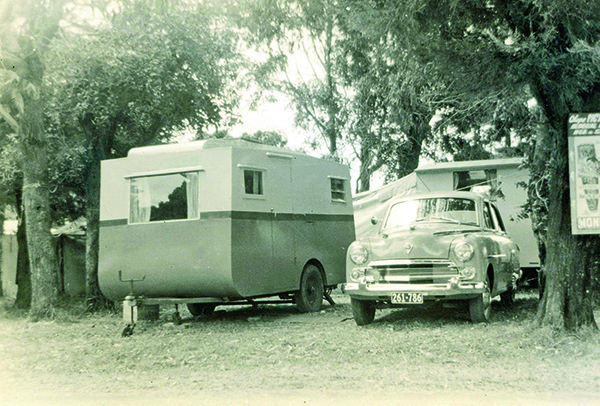 We had solar panels on the camper, but they were not very effective in those early days, and not all auto-electricians knew how to set them up properly. Eventually, we settled in Mackay, only 200km from where we started! Denyse and I went back to our old jobs: she as a GP and I started writing freelance for RV magazines. We sold the Cub camper and bought a larger one. 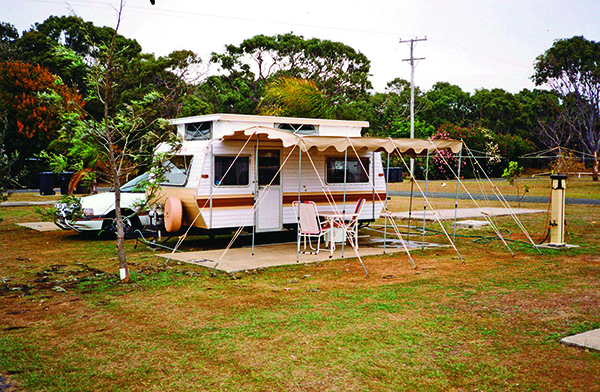 A 15ft pop-top Jayco followed the campers, and Denyse decided to work full-time only in school holidays and two days a week other times. This gave us five days a week to travel, along with annual holidays, and I could write more travel stories. I did some cabaret singing in my late teens and early 20s, and I have found great enjoyment in pulling out my guitar and singing beside a campfire at night. I am reminded of a night years ago when we camped by mistake in the day area at the Devil’s Marbles, NT, on our own. We heard something scratching around while I was singing beside a mellow fire, but didn’t expect applause when the song ended. Campers from the other area had arrived with their camp chairs and were sitting in a circle just outside the firelight, enjoying the impromptu performance. When Ros Bromwich took over as editor of Caravan World, she offered me the chance to write at least one travel article every month. This was a wonderful opportunity, working for one magazine only, and knowing the articles would be published. I have now been with Caravan World for 11 years. 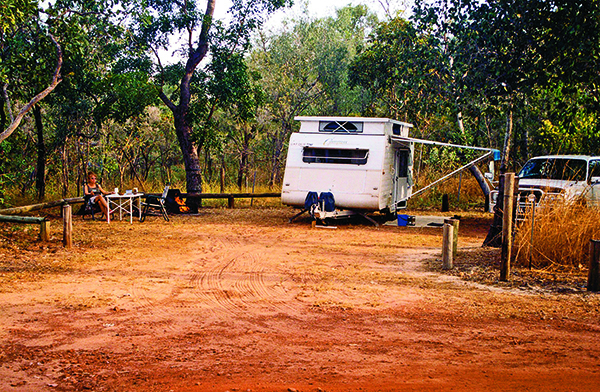 Later, we moved up to a 17ft Jayco pop-top and bought a 4WD, although we had managed well with cars, mostly Falcons, previously. We had many great times in this van, and I well remember coming off the corrugated dirt road into Agnes Water/1770 onto the sealed highway at Miriam Vale and losing our water tank. It was badly holed, so we bought another one at Bundaberg. The dealer fitted it, but when we filled it, we found it had a hole, too. We had our money refunded as the dealer had sold us a second-hand tank. Eventually, Denyse retired after 30 years in general practice, and could travel with me on longer trips and help me with my articles. To this end, we designed our own van and had it built by Roadstar. It had to be small enough to get into national parks and offroad places, be comfortable enough to live in for months, and it had to be built strongly. About 16ft inside would be as small as we could go. This was in 2001, and we still have the same van today. We were less fortunate with the new Ford Explorer 4WD. We blew up two gearboxes on an around-Australia trip. The first was near Karijini National Park, WA, and the replacement near Robinvale, Vic. We traded it in the day after we returned home! 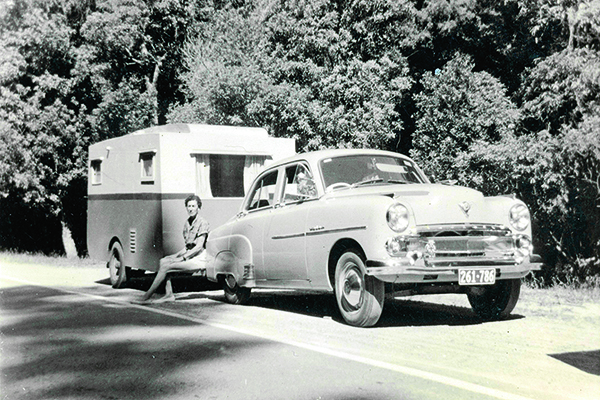 This van and 4WD combination took us to many wonderful spots around the country, as you would have read in Caravan World, although now we prefer a bit more comfort and have changed our vehicle to a Ford Territory petrol Titanium. What would we change in the van? Not much. We would probably have an ensuite now, and maybe change our fluorescent lights to LEDs. An ensuite, however, means a bigger van, carrying more water and using more power and buying a larger, more expensive vehicle to tow it. When Max Taylor took over as editor from Ros, he kept me on the same arrangement, and gave me further opportunities to write. From a start of just a few articles in Caravan World, we are still writing one travel story each month, as well as a website video to accompany it. 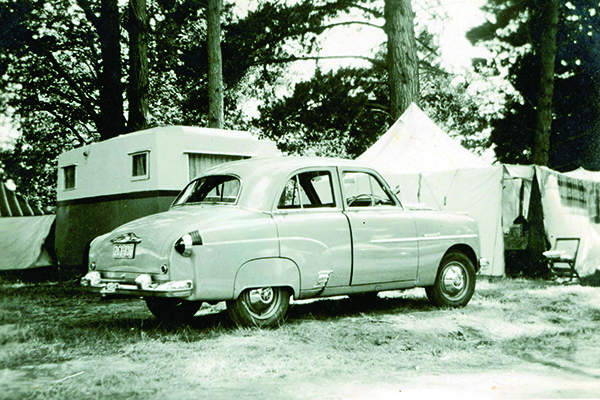 We write special features such as this one, and review new products that may appeal to caravanners in a ‘Road Tested’ column. You can see our blogs on the Caravan World website, as well as the the odd Facebook entry. Our writing trips have taken us around Australia four times and back and forth to Western Australia, the Northern Territory and other states many times. We are very happy with our lot, and very lucky to have such a good boss, and the opportunity to travel all over this great country and get paid for it. We have met some amazing people and made some great friends: what a wonderful way to spend your retirement. 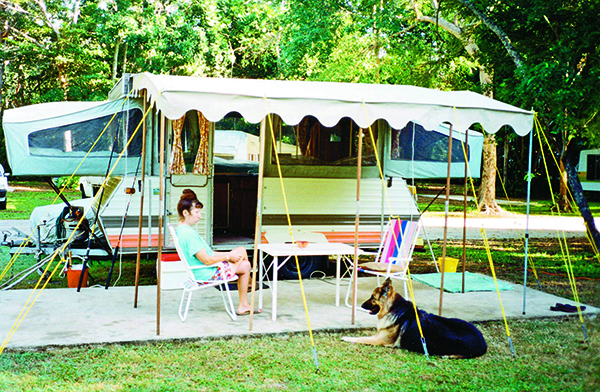 The full feature appeared in Caravan World #535 March 2015.